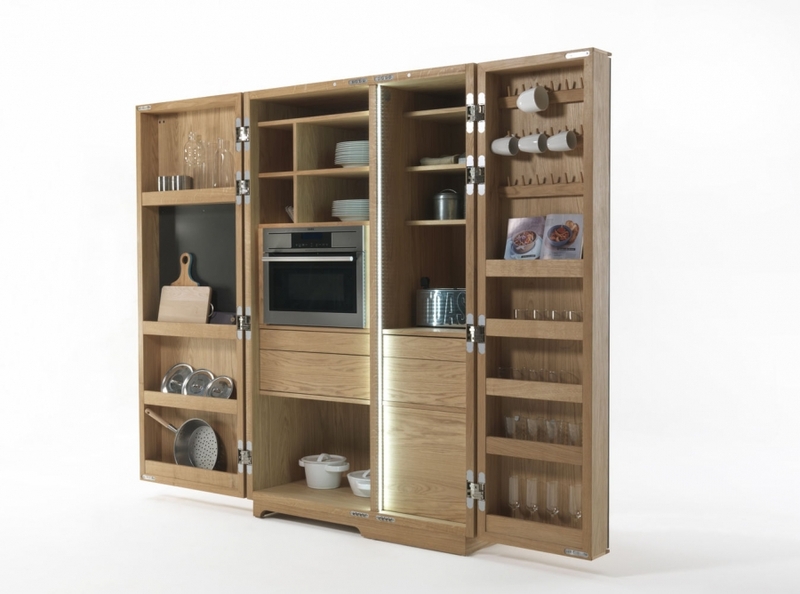 A multifunctional storage unit; it offers several options depending on the context: kitchen, dining room, manager’s office, restaurant, wine bar etc. 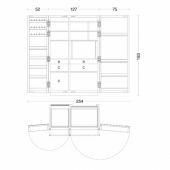 The equipment and the internal accessories have been selected and designed according to their function and can be customized to meet each individual client’s needs. 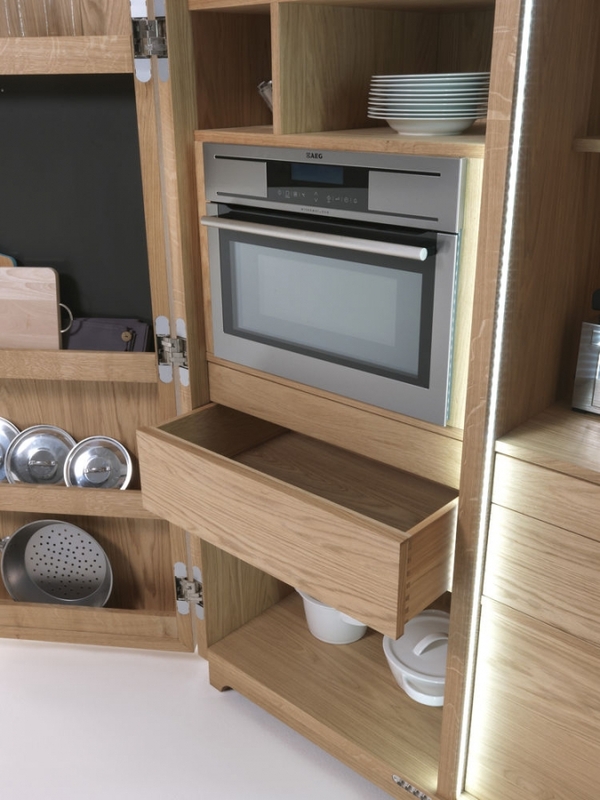 See how small domestic appliances usually present in a kitchen area, like a coffee machine, microwave oven, cups, glasses, dishes, and all that the wine or beer lover requires can be used in a practical way inunconventional contexts, thanks to the elegance of the Cambusa line. 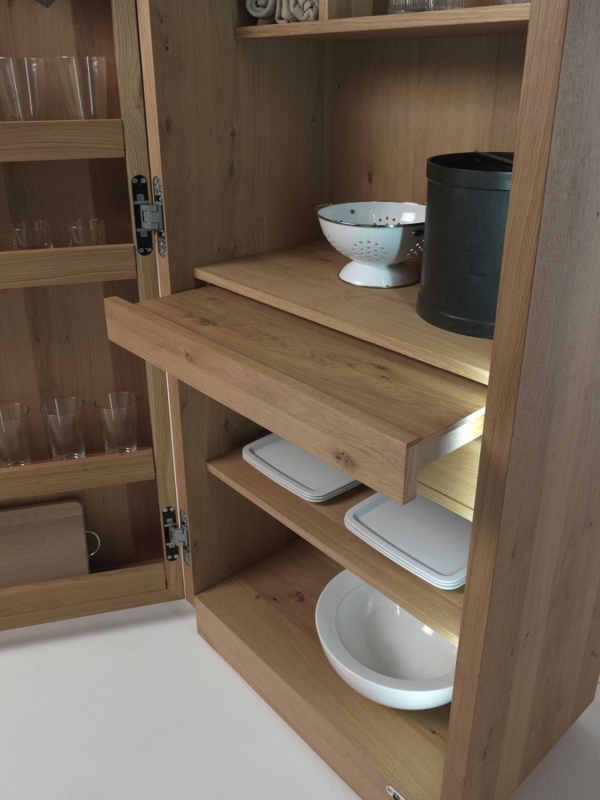 The big doors are stand-out feature of this piece of furniture: they are manifactured so as to allow glasses and objects of various sizes and shapes to be stored. In addition, the internal spaces are lit by a system of LED lights positioned along the whole height of the internal side panel. 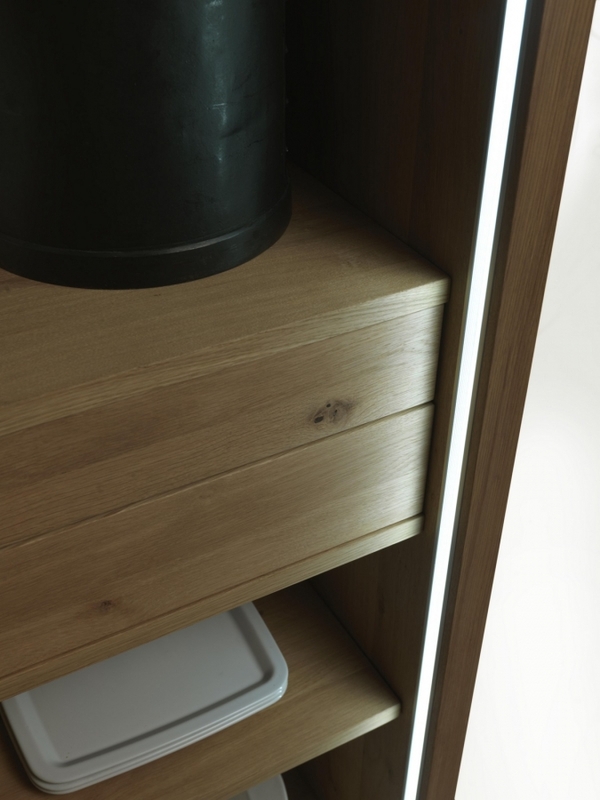 These lights come on automatically thanks to sensors which activate the LEDS when the door is opened. 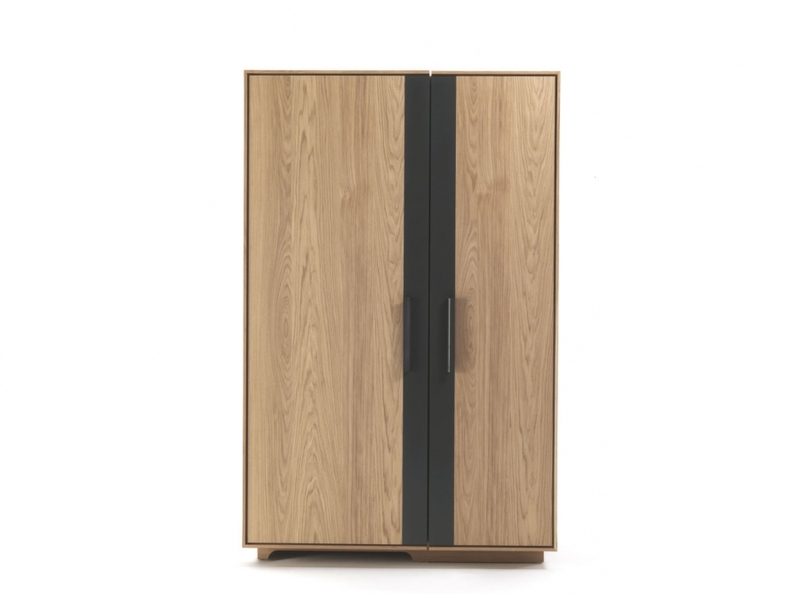 Cambusa, pictured here in walnut, is also available in oak and in all the types of wood in the R1920 Collection. 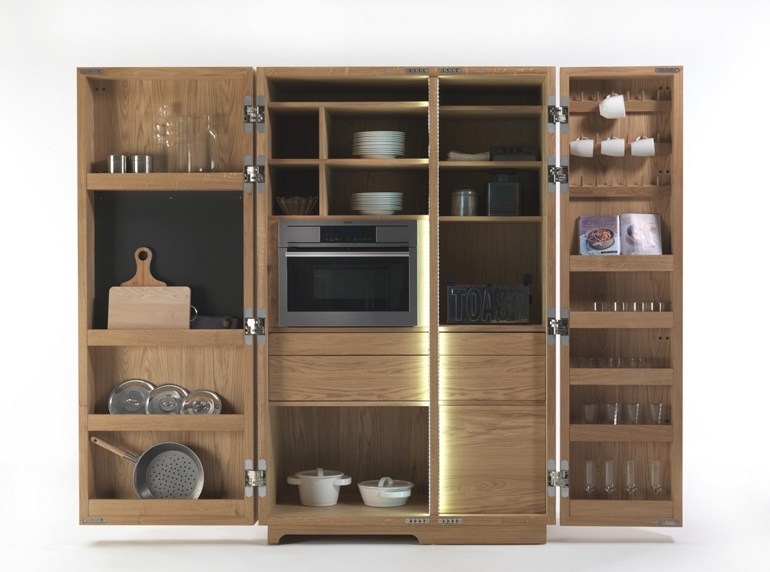 Cambusa Cook: Central storage unit with 3 drawers, 2 pull-out shelves. Opening with Push-Pull system. 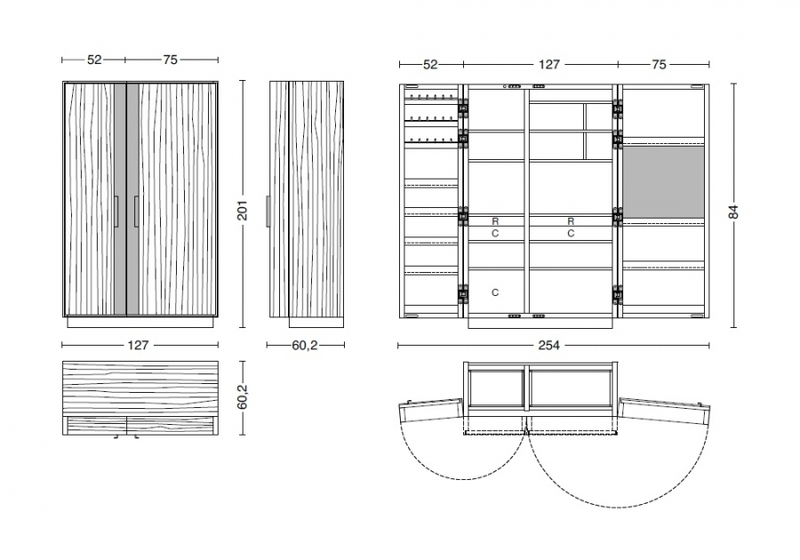 12 open spaces divided by fixed shelves. 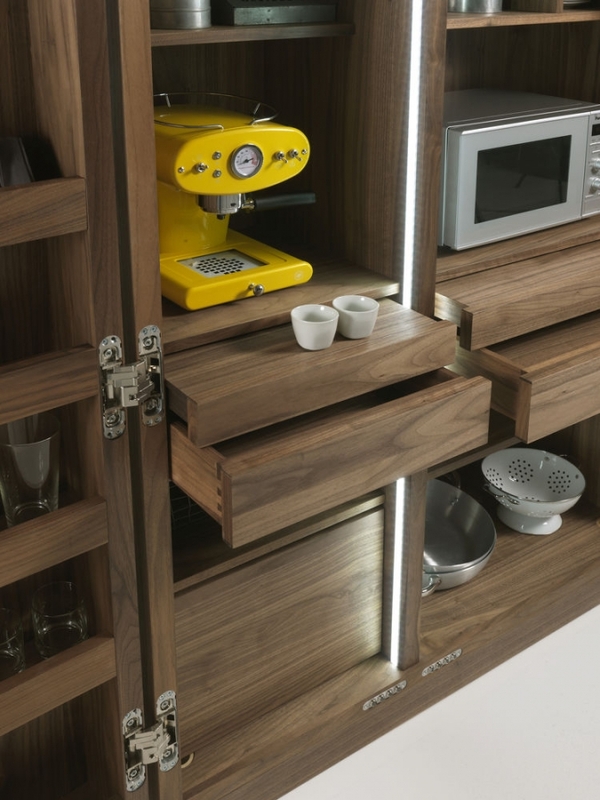 Left door: n°3 rods for coffee and tea cups, n°5 multifunctional shelves. 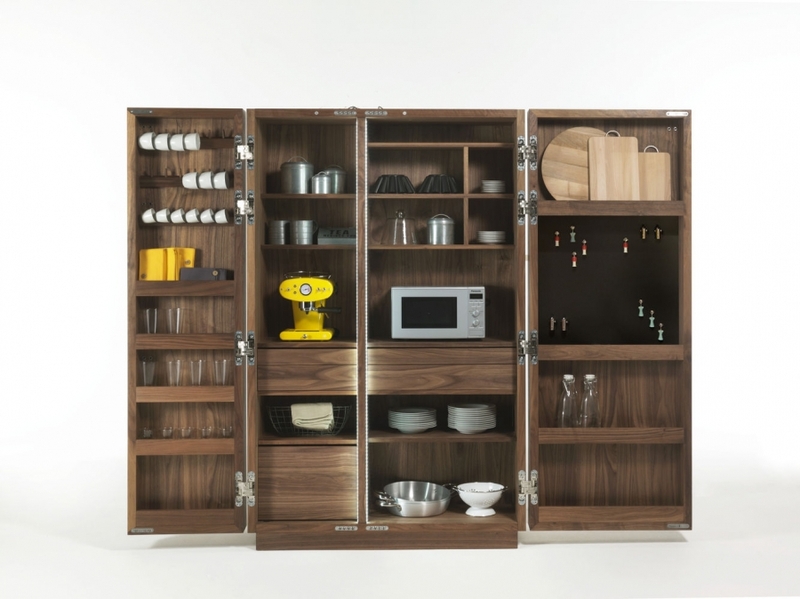 Right door: n°4 multifunctional shelves, n°1 metal panel for magnets. 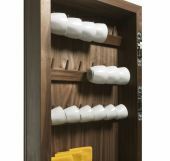 Cambusa Cook Jumbo: Maximum sizes for built-in appliances: L 56 x p 55 x h 45 cm. 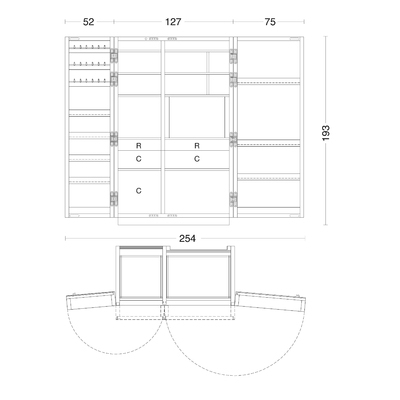 Central storage unit with 3 drawers, 2 pull-out shelves. 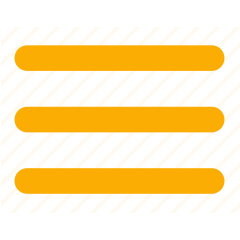 Opening with Push-Pull system. 11 open spaces divided by fixed shelves. 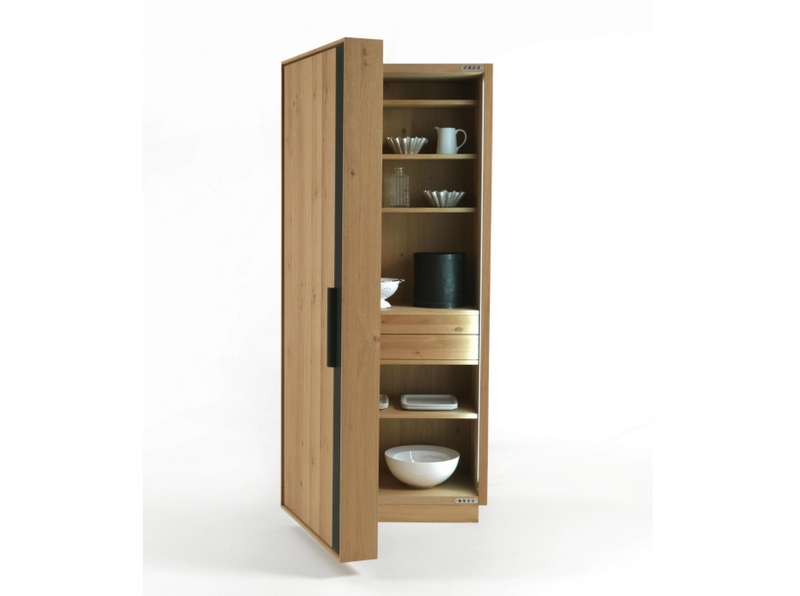 Left door: n°3 rods for coffee and tea cups, n°5 multifunctional shelves. 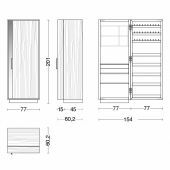 Right door: n°4 multifunctional shelves, n°1 metal panel for magnets. 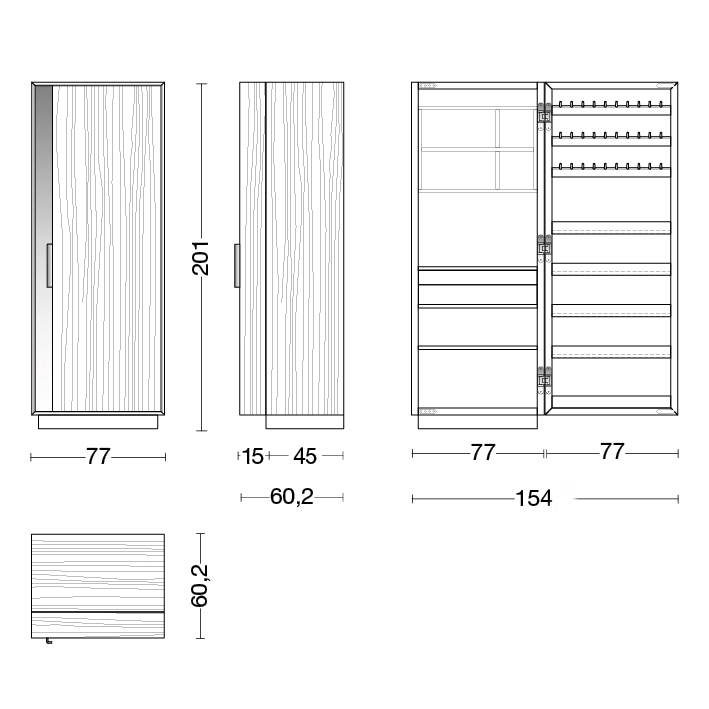 Cambusa Cook small: Central storage unit with 1 drawer, 1 pull-out shelf. Opening with Push-Pull system. 8 open spaces divided by fixed shelves. 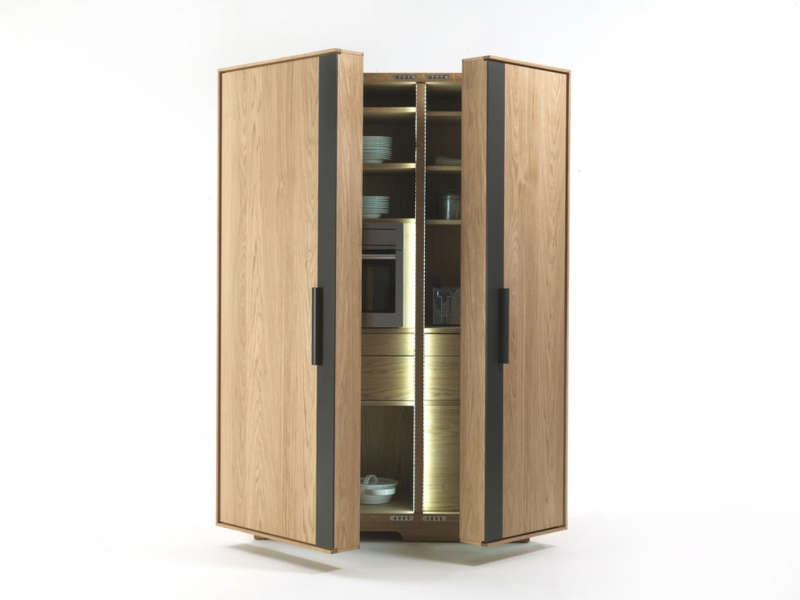 Door: n°3 rods for coffee and tea cups, n°5 multifunctional shelves. Cambusa Cook Jumbo: Maximum sizes for built-in appliances: L 56 x p 55 x h 45 cm. 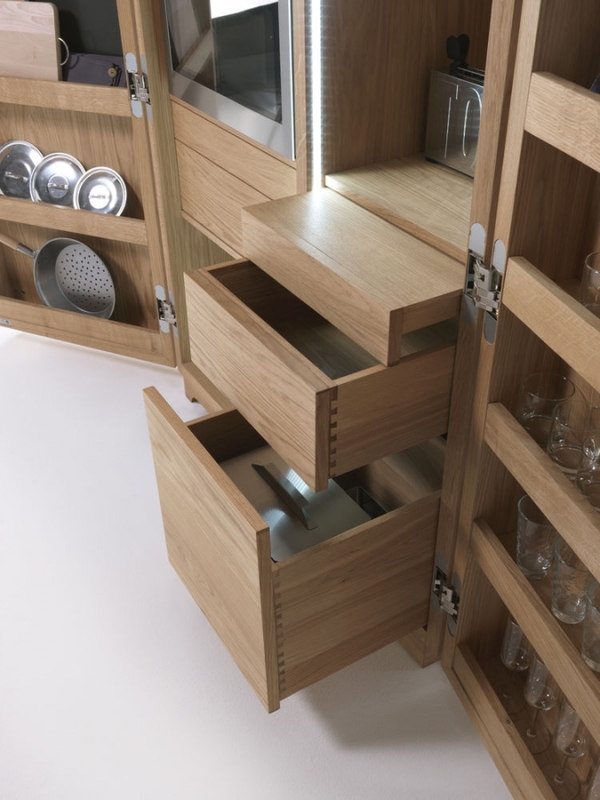 Central storage unit with 1 drawer, 1 pull-out shelf. Opening with Push-Pull system. 11 open spaces divided by fixed shelves. Door: n°3 rods for coffee and tea cups, n°5 multifunctional shelves.